The families of Tyrone man Joe McDermott and Gerry Bradley from county Derry have been left devastated by their deaths in a workplace accident yesterday in Perth, Australia. 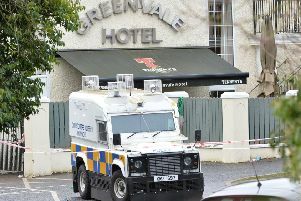 It is understood that 24-year-old Joe, from Omagh, had moved to the city just weeks ago, while Gerry, 27, who was from Portstewart is thought to have been just days away from travelling home for Christmas. The two men were crushed by a concrete slab that was being unloaded by crane from a delivery truck, while they were taking a break from work on a $20m apartment complex in the city. Joe’s family said: “We are devastated by Joe’s death. We will always remember him as the bright and bubbly young man that he was. Gerry’s brother Gregory said he can’t believe what has happened to his “happy, friendly” sibling. “He would be one of the few people I don’t know anyone who had a bad word to say about him. We can’t believe what has happened. He enjoyed life,” he said. Jaxon Construction who were carrying out the work on the apartment complex said in a statement: “Our heartfelt thoughts and condolences go out to the families, loved ones and colleagues of the two men involved in this tragic accident. “Counselling support has been offered to all 52 employees and contractors who were on site today and also to JAXON’s wider workforce. “JAXON has been in operation since 1958, and in 57 years had never experienced a fatality. Hundreds of tributes have been paid to the two young men on social media. Speaking from Perth Australia, Tom Bradley from the Claddagh Association said he is working with the Bell Trust to try and repatriate the young men’s bodies for burial in their home counties. Speaking about the young men who were tragically killed, he said: “They are not that long here. I think they were new arrivals - they work for lads from Tyrone as well... a couple of brothers. “They were having a cigarette and there was a crane just lifting slabs and one fell,” he added. The incident - reported to have happened on the corner of Goderich Street and Bennett Street in East Perth at about 11.30am, Australian time - is now being investigated by local authorities.